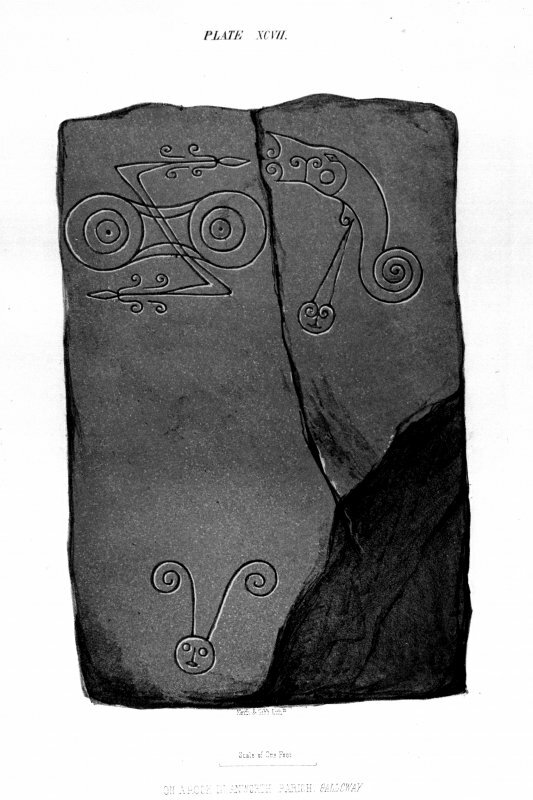 Scanned ink drawing of Trusty's Hill rock-carved Pictish symbols. Besides its vitrified character, the fort on Trusty 's Hill (No. 13, NX55NE 2) is remarkable for the presence of certain sculptured symbols, usually associated with the early Celtic church, on the north face of the most southerly of the two projecting rocks between which has passed the approach to the summit. The symbols (RCAHMS 1914, fig. 11), are deeply incised, and are as follows:- in the upper left-hand corner the double - disc ornament traversed by the Z –shaped fioriated rod; to the right, and separated by a natural fissure, a lacustrine monster ; and immediately below it a heart-shaped figure with incurvation terminating in spirals and surmounted with a conical spike; at the left-hand lower corner a hum an mask wit h two horns ending in spiral curves on the top of it. An iron grill has been placed over the carvings for their protection. See Early Christ. Mon., pt, iii, p. 477 (illus.). The fort on Trusty's Hill is the only place in Galloway where the Picts are known to have left a recognisable mark. Carved on a rock beside the entrance passage are a series of Pictish symbols, including a water beast and a double disc traversed by a Z-shaped rod. Why these symbols are here, so far from Pictland, is a matter of speculation, but like other outliers in Mid Argyll they may commemorate the activities of a Pictish raiding party. 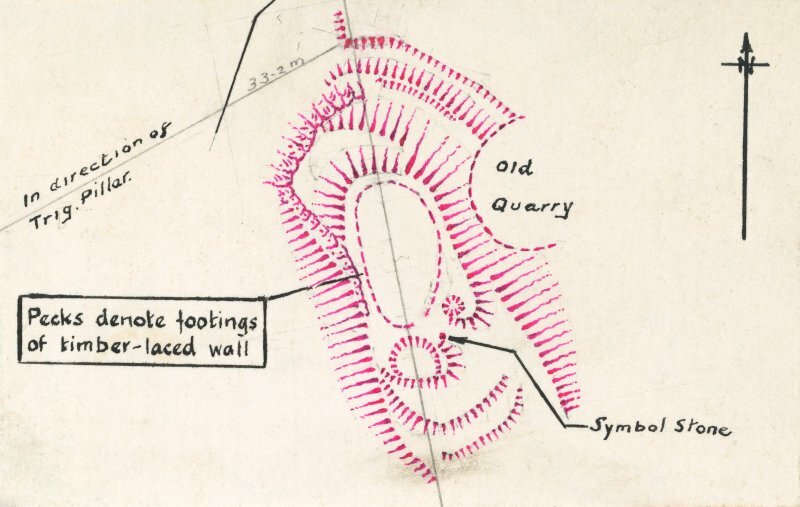 The burning of the fort as the result of such a raid may have been the cause of the vitrification evident in the remains of the stone rampart around the hilltop. This rampart, about 1.2m thick and originally timber-laced, encloses a roughly oval summit area some 24m by 15m in extent with an entrance on the south side. On the north-eastern side a substantial bank and rock-cut ditch cuts through the neck of the promontory. Excavations in 1960 suggested that these defences belonged to the earliest phase of occupation, perhaps a fortifIed homestead of the Roman iron age; a small sub-circular stone-built hut of this period was located in the hollow on the east side of the entrance passage, opposite the symbol-carved rock. A later phase is represented by the outworks on natural rock shelves in front of the entrance, but these ramparts were of relatively slight construction, revetted only on their outer faces. The re-fortifIcation belongs to a post-Roman period of military engineering, but whether a product of the Britons ofRheged or the Angles of Northumbria is hard to say. The name itself 'Trusty's Hill', probably has some association with this secondary phase, but the personal name from which it derives is as likely to have been a Celtic Tristan, matching Mark Cno. 45), as a royal Pictish Drust. Legend and folklore refer to a Pictish king of this name who 'reigned' in Galloway in 523-8, but there is no evidence of Pictish settlement in the province. The name of the hill, like the symbol stone, may simply commemorate the signal military and logistical achievement of the leader of a Pictish task force! Three Pictish symbols - a double-disc and Z-rod, a 'Pictish beast', and a conical spike terminating in two spirals - are carved into the living rock immediately inside the S entrance to the fort (NX55NE 2.01) on Trusty's Hill. A considerable amount of graffiti has also been carved into the outcrop. The outline of a face carved below the double-disc and Z-rod appears to be part of this graffiti. 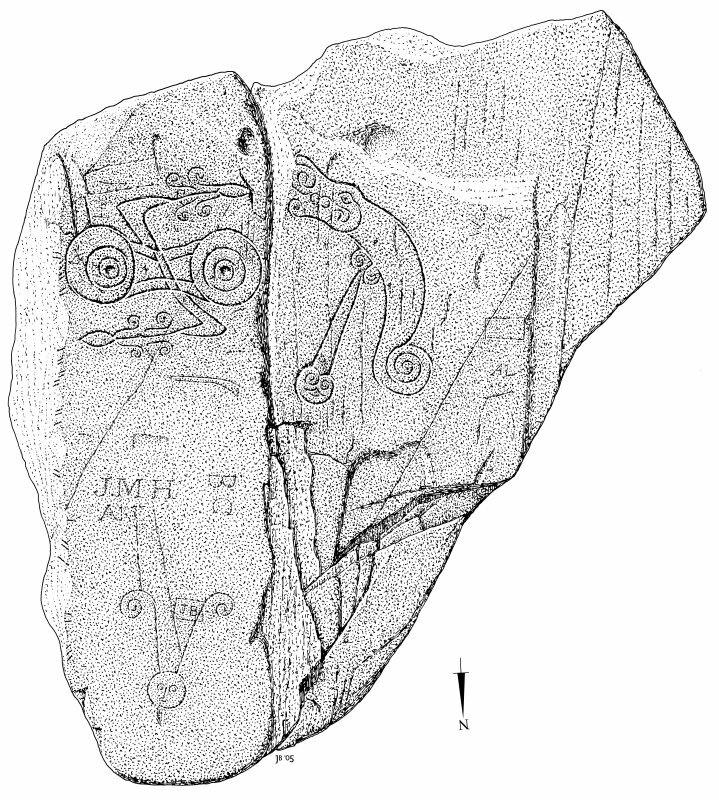 Class I symbol stone showing a double-disc and Z-rod with a fish-monster and sword to the right.